Gold prices hit a 7-month high Tuesday as oil tumbled along with U.S. stocks as economic concerns drove investors to safe-haven purchases. New York silver, gold and platinum futures gained 2.8 percent, 2,7 percent and 3.5 percent. March crude-oil plummeted $2.58, or 6.9 percent, to close at $34.93 a barrel. The average price for regular unleaded gasoline fell one-half cent to $1.96 a gallon, according to AAA. March silver rose 38.5 cents to close to $14.01 an ounce. Gold for February climbed $25.50 to end at $967.00 an ounce. © CoinNews.net for Coin News, 2009. | Permalink | No comment | Want more on these topics? Browse the archive of posts filed under Bullion Articles and Precious Metal Reports, Business News. 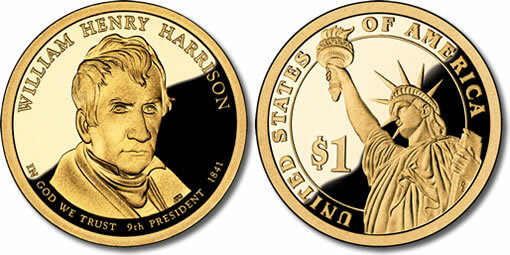 William Henry Harrison Presidential $1 Coins were officially launched in a ceremonial release on Presidents Day (Monday) by the United States Mint. The event was held at Harrison’s old Virginia home at the Berkeley Plantation. In keeping with tradition, thousands of newly struck coins were given to children while adults exchanged for $1 rolls. The coin is the first Presidential Dollar of 2009, the 9th issued to honor US Presidents, and the first to include "IN GOD WE TRUST" on the obverse, or heads side. The Consolidated Appropriations Act of 2008 mandated the motto move from the edge, as seen in 2007 and 2008 $1 coins, to its now more prominent location. © CoinNews.net for Coin News, 2009. | Permalink | No comment | Want more on these topics? Browse the archive of posts filed under Coin or Numismatic News, New Coin Releases, Presidential Dollar, United States Mint News and Information. Simm’s students poured over the little blue books in front of them with much more attention than they normally would.That was probably because they were filled with money. The class welcomed Wareham attorney and numismatist (one who collects coins) Paul Scannell last Thursday to talk a little about both President Abraham Lincoln on his 200th birthday, as well as the coin that bears his image. © CoinNews.net for Coin News, 2009. | Permalink | No comment | Want more on these topics? Browse the archive of posts filed under Coin or Numismatic News, Numismatic Headlines. The first new 2009 Ultra High Relief Double Eagle Gold Coin was certified by Professional Coin Grading Service (PCGS) on Friday, February 13. It was graded Mint State 70. "We were thrilled to examine the first submitted example of this eagerly anticipated modern masterpiece. It’s one of the finest designs ever created for United States coinage and a testament to the excellence of the United States Mint," said Don Willis, President of PCGS, a division of Collectors Universe, Inc. (NASDAQ: CLCT). The coin was submitted by collector Charles Camp of Savannah, Georgia who said he was thrilled with the certification: "I’ve always been a big admirer of PCGS, and I think it’s a great thing." 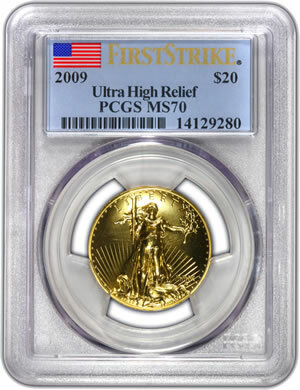 In addition to the MS70 grade, the coin was given a First-Strike® (http://www.pcgs.com/firststrike) designation by PCGS and encapsulated in the company’s proprietary TriVue™ holder. © Professional Coin Grading Service (PCGS) for Coin News, 2009. | Permalink | No comment | Want more on these topics? Browse the archive of posts filed under Coin or Numismatic News, Press Releases and Announcements, United States Mint News and Information. The just released 2008 United States Mint Annual Report offers a candid assessment on the performance of the US Mint that highlights both the good and the bad, and mixes in challenges and strategies. At the end of the fiscal year, the agency generated sales of more than $2.8 billion and made history in creating 126 coin designs — both good. But the Mint also earned less than it did in 2007 — one of several disappointments for the year. 2008 proved to be robust for the Mint’s numismatic and bullion coin programs. Each realized an increased net income of 22.7 percent and 295.6 percent. 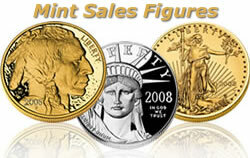 Demand for bullion coins popped with total sales registering an impressive $948.8 million. Collector coins came in second, pulling in $527.6 million. © CoinNews.net for Coin News, 2009. | Permalink | No comment | Want more on these topics? Browse the archive of posts filed under Coin or Numismatic News, United States Mint News and Information. The latest collector gold coin sales figures compare the most recent US Mint reported numbers to those provided on Jan. 29, when a change in American Eagle Gold Uncirculated coins was last seen. Gold climbed to a new seven-month high on Thursday while oil continued downward for a fifth straight day and reached a two-month low. New York gold futures rose 0.5 percent. Silver and platinum declined slightly by 0.1 percent and 0.3 percent, respectively. March crude-oil declined $1.96, or 5.5 percent. It ended the day at $33.98 a barrel to mark its lowest level since Dec. 19. The average price for regular unleaded gasoline increased 1.2 cents for the second straight session, rising to $1.952 a gallon, according to AAA. March silver lost a cent to close to $13.51 an ounce. 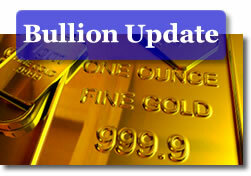 Gold for February increased $4.70 to end at $948.50 an ounce. (Edina, Minnesota) — The following brief statement was issued today by the Professional Numismatists Guild regarding the introduction of the first of four new reverse side designs of the familiar Lincoln cent going into circulation this year. "Based on the overwhelming success of the recently-ended 50 states quarters program, I expect the excellent new Lincoln cents designs will be quite popular with the public. But based on their utter lack of buying power and the costs to produce them, I wonder how much longer pennies will continue to be minted," said Gary Adkins of Edina, Minnesota, President of the Professional Numismatists Guild (www.PNGdealers.com), a non-profit organization composed of the country’s top rare coin dealers. "The United States stopped making half-cent denomination coins in 1857. The time may be near for halting production of billions of cents every year." © Professional Numismatists Guild for Coin News, 2009. | Permalink | No comment | Want more on these topics? Browse the archive of posts filed under Coin or Numismatic News, Press Releases and Announcements. The first 2009 Lincoln cent launch and the remaining three penny designs were captured today by a 49 second video clip from the Associated Press. The new cents commemorate the bicentennial of Abraham Lincoln’s birth, which is today, and the 100th anniversary of the first issued 1909 Lincoln cent. The embedded video provides a detailed 3D-view of each coin, offering an unparalleled perspective. © CoinNews.net for Coin News, 2009. | Permalink | One comment | Want more on these topics? Browse the archive of posts filed under Coin or Numismatic News, New Coin Releases, United States Mint News and Information, Video News and Media Stories. A METAL detector who dug up an invaluable hoard of Roman coins in a South Devon field has been told: “You can’t keep them.” The 243 coins were thought to have been stashed away by Roman Britons more than 1,500 years ago just as the Empire was on the verge of collapse.